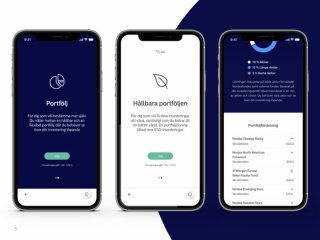 As experience designer in Nordea I designed the Nordea portfolio designer, a do-it-yourself fast and easy investment builder. The work included both the exploratory design phase and a follow up usability tests. It will release in Sweden April 2019. It was important in the agile corporate environment to include a lot of stakeholders from the get go (business, legal, compliance and growth) to ensure everybody felt agency over the product and included in the design process. It was designed and released over about 4 months, which is really fast in Nordea standards. Next steps are a total Nordic launch.